Remothered: Tormented Fathers was released via Early Access on Steam just in time for Halloween 2017. Whilst choosing to use Early Access is usually implemented as a way to aid a game’s funding during development, the team made it very clear that this was not their motivation. In fact, the game was completely funded from the get go; Chris Darril chose to use Early Access as a way to actively involve the community in the development of the game. It is also worth noting that the Early Access version of the game only featured about 2/3 of the game’s content; so it has only been the in the past week that fans have been able to experience the full game. And what an experience it is, a truly terrifying experience. As a self-confessed ‘tech geek‘ I can discuss hardware and the science behind it for days, so lets get that bit out of the way first. I was quite surprised at the system requirements for Remothered: Tormented Fathers, which I browsed through whilst the game was installing. The minimum requirements were fairly conservative: Quad-core Intel or AMD processor, 4GB RAM, and an Nvidia GeForce 470 GTX or AMD Radeon 6870 HD series graphics card. But the recommended specs caught my attention: Quad-core Intel i7 processor, 8GB Ram, and a GeForce GTX 1060 or equivalent graphics card. Whilst my hardware is by no means ‘brand new’, I am usually well above the ‘recommended requirements’ for PC games these days. As my Devil’s Canyon (i7 4790K) runs at a healthy 4.6Ghz (I lowered it down from 4.8 for a little more stability) and my Gainward GTX 1060 6GB has a healthy overclock as well, I figured I should be alright. 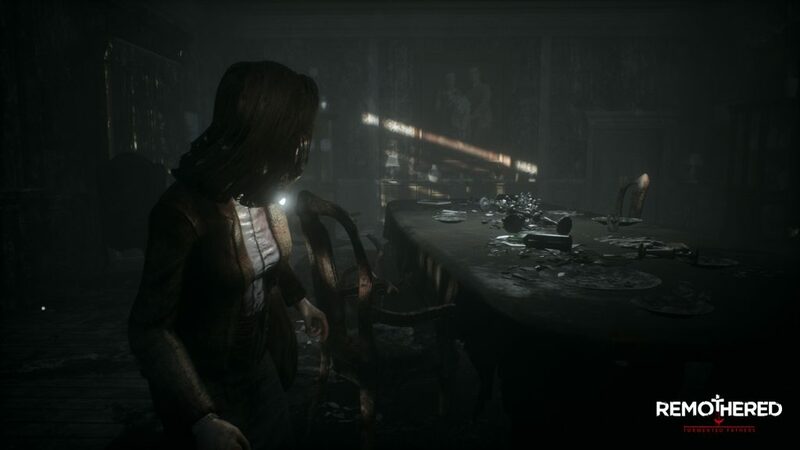 Upon loading up the game I soon realised why Remothered: Tormented Fathers recommended some beefy hardware, the game was developed using Unreal Engine 4. I should clarify here, using UE4 does not automatically mean a game will require expensive hardware to successfully play; it is after all just a suite of development tools that allows programmers to use C++ to make a game in real-time. But the potential – if a dev chooses to take advantage of it – of Unreal Engine 4 opens up the possibilities for advanced AI, state-of-the-art cinematics, an advanced audio engine, and more. Turns out that Stormind Games took full advantage of the tools they had at their disposal. As I play with 1080p 60hz panels, with V-Sync on, the game defaulted to Ultra settings and looked absolutely fabulous. Just to see how my hardware was holding up, I briefly turned off V-Sync and the game shot up to around 150fps; and without really breaking a sweat if I am completely honest. This leads me to believe that you can probably get away with specs lower than the recommended, but results will vary depending on what resolution you play at (I wish I could see this game firsthand in 4K). What I will say though is that Ultra is clearly the detail level that this game is supposed to be played at. Anything less than Ultra and visual quality significantly drops, at High the textures become quite muddy; Medium and Low are abominations that will not be spoken of. But Ultra though, the game fully immerses you thanks to the gritty, dark, and atmospheric graphics. These stunning visuals are perfectly accompanied by top notch audio, the soundtrack was composed by Nobuko Toda (Final Fantasy, Halo, Metal Gear Solid 3/4/Peace Walker) and believe me when I say that it produces a truly terrifying experience. More often than not, it was the dynamic music (tempo adjusts accordingly depending on threat) that kept my blood pressure up; and the first jump scare I received actually resulted in me having to pause the game and go ‘wind down’ for a little while. After several cups of tea and a few cigarettes, I made the conscious decision to plug in a controller rather than use my mouse and keyboard. 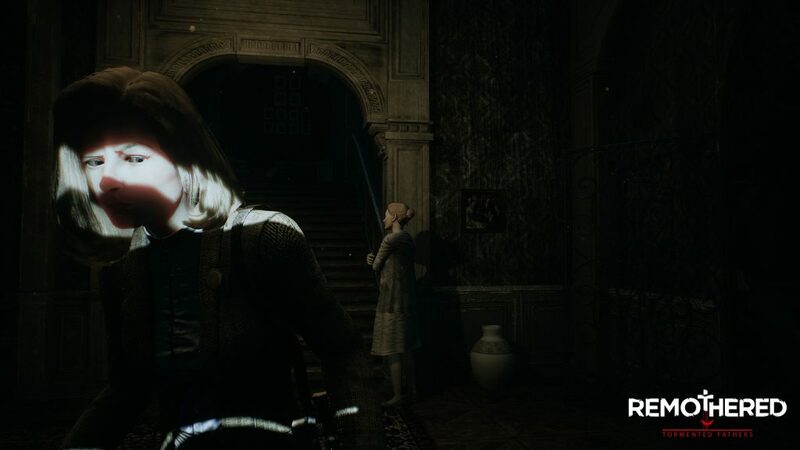 Don’t get me wrong, controls were superbly smooth, and I would say playing Remothered: Tormented Fathers either way will deliver an excellent and fluid experience. I just needed to give myself a little more ‘breathing room’ between my monitor and myself. That’s right, this game scared me into using a controller just so I could back off and assume a more relaxed position; absolutely nothing to do with ergonomics, this was to ensure I made it through this game alive. Literally. As I mentioned earlier, I have not played this particular genre of game in a long time, so I was not quite sure what to expect. Was I going to be shooting things? Was there going to be countless waves of enemies trying to kill me? Simply put, no and no. Remothered: Tormented Fathers draws you in with a magnificent story-driven experience, and I would love to really discuss it at length; but I feel that the story needs to be experienced rather than explained. So I will instead try to describe the game without divulging any ‘spoilers’. Speaking of story though, through the use of cinematics and collectibles that are scattered throughout the environment, a wonderful web of intrigue is spun; both directly and indirectly. What I mean by this is that the way this story is told, you find yourself constantly questioning what is actually going on. Whilst you may find sitting and reading some of these items as an unwelcome interruption, I found them to be a delightful additional method of immersion. I found myself theorising aspects of the story, or rather analysing the motivations of the characters on my own accord, rather than having it all laid out for me. All whilst having a chronic sense of dread and fearing (not wondering) what is going to happen next. Whilst the game has a huge investigative aspect to it, solving puzzles by finding a necessary item and so forth, the majority of the game is about surviving (guess that is why they call these Survival Horrors). The funny thing is that this aspect of the game caught me off guard, I was minding my own business investigating then all of a sudden the antagonist was around the corner (this was the initial scare I mentioned earlier) and was intent on killing me. 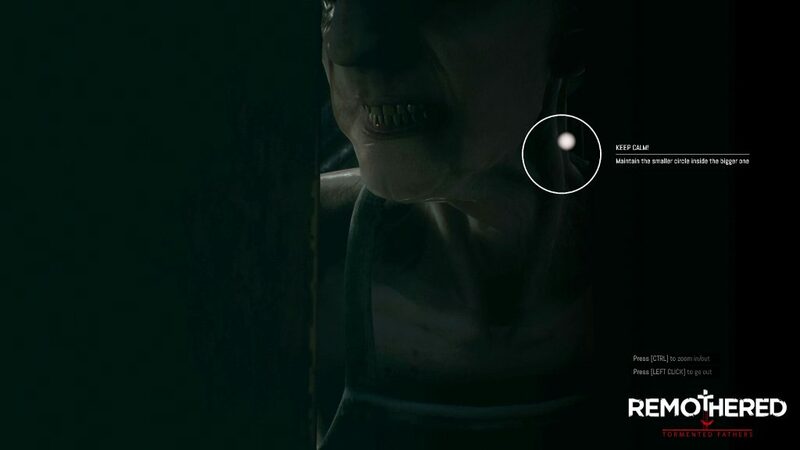 This is when I learned that Remothered: Tormented Fathers uses the QTE (quick time event) method for context-sensitive gameplay, which is just a fancy way of saying ‘push this button when the game tells you to’. These prompts occur in a variety of situations: if the antagonist gets a hold of you, when you encounter environmental hazards, and in other situations as well. For example, if you successfully get away, you can try to run and hide somewhere. During the enemy’s investigation they may come really close to finding you, a circle then appears and you have to keep a visual element within a circle to simulate you ‘staying calm’. Overall, the implementation of QTE is quite well done, and adds great little mini-games which are sometimes paired with cinematic cut scenes. Combat itself is not a integral aspect of the game, you will find ‘defensive’ weapons throughout your journey; but these are only used as a last minute way to prevent your death, and are a one-time-use item. Remothered: Tormented Fathers is much more reliant on evasion and diversion than combat. Evasion is simple enough, remember that amazing atmospheric audio I mentioned? Whilst the music truly is amazing, it is all the creaks of the floorboards and ramblings of the antagonist that you will be paying particular attention to. If the enemy is upstairs, you can hear the floorboards creaking underneath their steps; likewise, if you aren’t quiet with your own maneuvers, they will quickly come investigate what the commotion is. This results in you constantly keeping an eye (and an ear) out for where exactly your would-be killer is at all times, and likewise being very cognisant of trying to stay quiet and out of sight. This is where evading whilst at the same time studying your enemy comes into play, resulting in a very passive style of play. If you wish to be more pro-active however, you have the power of diversion at your disposal as well. You have the ability to hold 3 diversion items in your inventory at a time. These range from simple bricks that you can throw (you can even throw them at the enemy in a pinch) to music boxes which have a slight delay before they activate. This enables you set up an area that you want the antagonist to investigate, most likely resulting in the path or area you want to travel to being clear and unobstructed. One of the things I really liked about Remothered: Tormented Fathers was the lack of a health bar. Rather than having a meter to visualise your current health, the game instead relies on your appearance. If you have been ravaged by the enemy, you certainly look like you have been through an ordeal, and even your movement and breathing is heavily affected by your weakened state. The mechanic for healing yourself is handled quite well, throughout the environment you will come across mirrors (which are linked to the story funnily enough) that offer unlimited saves and one-time heals. As you restore your physical state, the mirror progressively cracks; a really nice aesthetic that also adds to the overall creepiness of the game. These mirrors are placed in relatively safe locations, and I did not feel they were in abundance; so if you encounter one, I suggest saving your game whenever you can. If you happen to die you are rewarded with a glorious cut-scene of your demise-which can vary by the way-and will start over from the last mirror you gazed into. Early in the game I did not die too often, but as I became more confident and took more risks I got fairly used to trying again from the last mirror. 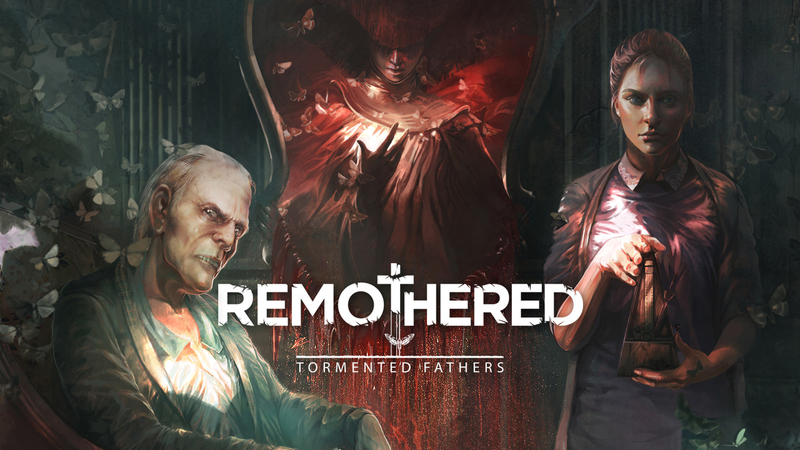 Whilst this is not the type of game I typically play, I don’t think I found Remothered: Tormented Fathers too difficult. I don’t mean that is was easy by any means, it presented a challenging experience, but without being overly punishing. I learned from every death, with only a few situations occurring in the ‘late game’ that were slightly frustrating. Some of these were due to unexpected QTE prompts, but once aware of them, they were quickly overcome. The frustrating deaths near the end were mainly due to being in situations that I did not feel I had necessarily encountered before; but in retrospect, that is probably due to the way I played the game. These late stages were heavily reliant on diversion, whilst the majority of my play through had relied on evasion (what can I say, I was always a fan of Splinter Cell). Once I realised what I had to do, I quickly got past these areas and thoroughly enjoyed the final hurdles of the game. At the end of this fantastic journey, I had played the game for a total of 6 hours. On one hand this is a relatively short amount of time for a game, but I think considering the price as well as the sheer terror it incites, this is the perfectly sweet spot for Remothered: Tormented Fathers. I can wholeheartedly proclaim that I was on edge for the entire game, my only respite was during cinematic cut-scenes or when I paused the game to take a break. 6 hours of tension/anxiety/pure primal fear is more than enough for the human body if you ask me, and once you factor in that this is the first chapter in a Trilogy, the length makes even more sense. This game is a psychological horror, and by that I mean it relies on mental, emotional, and psychological states to disturb the player. Psychological horrors create dread by exposing our own vulnerabilities, whilst also revealing the darker parts of the human psyche that most of us repress. Remothered: Tormented Fathers does this masterfully by implementing realism, this could actually be based on a true story; rather than relying on scary monsters or occult ideologies. Remothered: Tormented Fathers delivered something to me that I did not realise I was looking for, or rather something I did not think a game would provide me with. A truly cinematic experience that scared me, in the nicest possible way. The way that the game flows, the masterful introduction, the structured plot development, the wait, the climax, the dramatic events, and the satisfying epilogue have been painstakingly crafted together to produce an experience rather than a game. Partnered with stunning visuals that make heavy use of motion capture technology, the atmospheric soundtrack that will make the hair stand up on the back of your neck, and your own natural instinct to be afraid; Darril Arts and Stormind Games have delivered an experience that is well worth your time to delve into. If you do not have a PC to experience this wonderful story, then not to worry, as this game will also be released for the PS4 and XB1 at some point (hopefully) this year. I sincerely hope that the team makes it capable of taking advantage of the PS4 Pro and Xbox One X, the thought of being able to play this again in 4K in the living room excites me. I think I would even have to try and drag my significant other into watching it, as I firmly believe it would give her a good fright as well. Whilst Remothered: Tormented Fathers was certainly not on my radar previously, I will be closely keeping tabs on the team, as I sincerely look forward to the next chapters of this stunning series. Now, I wonder if my editor is willing to replace the underwear I somehow ruined during this review? Remothered: Tormented Fathers is a thrilling psychological horror that has been meticulously crafted in every aspect: storyline, visuals, audio, gameplay. The true horror would be not picking up this fantastic title.